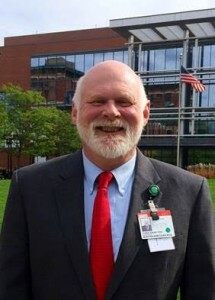 Chris Andry earned his doctorate in pathology at Boston University School of Medicine (BUSM) and has worked at Boston Medical Center and Boston University for 35 years. Dr Andry is Vice Chair for Operations and Management and Associate Professor of Pathology and Laboratory Medicine. He also has an appointment in the Department of Family Medicine. Dr Andry serves as the Administrative Director for BMC’s Clinical Laboratory Services, was a former Executive Director for BMC’s Cancer Care Services and has been active as a Principal Investigator on a number of biobanking contracts with the National Cancer Institute (NCI) since 2010. These contracts have focused on applying NCI Best Practices and a Total Quality Management Program for high quality biospecimen collection, storage and distribution. Two recent projects, the Biospecimen Preanalytic Variables study and the Thrombosis in Cancer Patients study are exploring the impact of pre-analytic variables on biospecimens and biomarkers, collected from cancer patients. Dr Andry teaches pathology, public health and laboratory management in BUSM’s Graduate Medical Sciences division and has a particular interest in biobanking science and a passion for reducing disparities in cancer care and for providing high quality health care to an under-served population in the Greater Boston area. Last update on: 2017/09/12 09:28:58 UTC/GMT time.